People looking for a budget toilet often purchase a Glacier Bay toilet model at Home Depot, which is the only store that sells them. Glacier Bay toilets don't include many extras, and the problems that develop are the ones that develop with most other toilets. The flush valve may be a conventional single-flush or a dual-flush type, and either can leak, usually for different reasons. Troubleshooting other problems with these toilets is straightforward and uncomplicated. The first thing to check when the toilet fill valve won't shut off is the water level. If, after removing the lid, you see water emptying into the overflow tube, you can lower the water level by adjusting the float. Glacier Bay toilets have cup-style floats, and the float is connected to the fill valve by a notched plastic rod. Unhook this rod from the valve and lengthen it by one or two notches. This makes the float switch off the valve sooner. When the rod is adjusted properly, the water level should be an inch below the overflow tube opening. If the toilet valve mysteriously starts on its own, it's usually a sign of a leaking flush valve. You can verify this by putting food coloring in the tank water and waiting a few hours without flushing. There's a leak if the bowl water takes on the color. Some Glacier Bay toilets have a flapper, and when it leaks, it usually means it's time for a new flapper. If you have a dual flush toilet from Glacier Bay, it has a flush canister, and the part that leaks is the seal around the tank outlet. To replace the seal, empty the tank, unhook the flush valve canister from the fill valve and unscrew it. Pull the seal off the bottom, put on a new seal and reassemble the toilet. Poor flushing can be caused by problems in the waste pipes, but it can also be the result of insufficient water flow from the tank. If your Glacier Bay toilet has a flapper, check the chain. If it's too long, the flapper might not be rising all the way and closing prematurely. 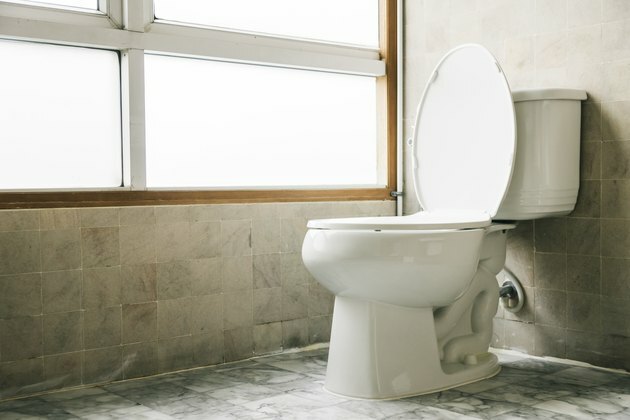 If the toilet has a flush canister, the problem may be that the rods extending from the flush buttons on the top of the tank to the buttons on the canister are too short. This means they aren't depressing the buttons on the canister far enough. You can lengthen each rod as needed by unscrewing the nut under the tank lid, pulling the rod out and tightening the nut. Like most toilets, Glacier Bay toilet models connect to the water supply by means of a flexible hose. While you're supposed to be able to tighten this by hand, sometimes it takes the help of adjustable pliers to prevent water from dripping. Tighten it, clean up the water and check to see if that solves the problem. If you have a two-piece toilet, you may also find water dripping from the bolts that hold the tank and bowl together. You need to turn the water off and empty the tank to tighten these. Water pooling around the base of the toilet is often the sign of a failed wax ring. Pull the toilet up, and replace the wax ring to prevent leaking. Leaks from hairline cracks on the tank or bowl mean that you need a new toilet as they aren't repairable.